January can be a difficult month for many, depression can stalk us when there is such little day light. Its lightened only by scenes like the one above that greeted me this week in Inveraray. Like many I have experienced and witnessed the impact of depression on myself and people I love and its a devastating illness. So often it's undiagnosed and diminishes lives, steals joy, steals life even. It's the great unspoken illness. Years ago we used to whisper the word cancer, now it's said more openly; but not so depression. It's still held secret often and nursed as something shameful; a failing. But no one would choose depression, would they? That dark tunnel of anxiety, that crushing burden of joylessness, that feeling of hopelessness, those weights tied to your life dragging it down making the simplest of tasks a nightmare to achieve. No-one would choose it and yet still guilt sneaks in, part of the symptoms it seems, destined to feed the condition, to further dent a fragile self esteem. The researchers had noted that depression frequently was preceded by illness and they noticed increased inflammatory responses. Is depression a kind of allergic reaction to illness perhaps? We recognise that inflammation plays an important part in our most recent epidemics and some suggest depression may even be as a result of infection.
" Others aren’t willing to go that far, not least because infection is not the only way to set off inflammation. A diet rich in trans fats and sugar has been shown to promote inflammation, while a healthy one full of fruit, veg and oily fish helps keep it at bay. Obesity is another risk factor, probably because body fat, particularly around the belly, stores large quantities of cytokines. Add this to the fact that stress, particularly the kind that follows social rejection or loneliness, also causes inflammation, and it starts to look as if depression is a kind of allergy to modern life ." Depression may be a kind of allergy to modern life; a challenging statement and yet it also makes sense. So what is the answer? It's complex isn't it? Perhaps not, the answer lies in an anti-flammatory pill say the researchers, maybe taken alongside an antidepressant to improve the effectiveness. Crack out the neurofen! Of course the solution to our modern life will be a pill, that's in keeping with how we run our modern lives, isn't it? But I found myself deflated when I read this. It was a bit like almost finding a secret treasure and then realising it wasn't special at all. If we think of allergies after all, we might take an antihistamine but we would also avoid what made us allergic wouldn't we? I agree it makes sense that depression isn't only psychosocial, but the solutions must surely also lie in how we live our lives and how we treat ourselves and others with compassion. I do hope our answer will instead be to begin to peel back the layers of the unintended consequences of modern living. We need to get back to eating food, ( see my blog on this) not a manufactured version of it and as a society we need to make that easy to do. Let's collectively acknowledge the impact of modern living on health and not blame individuals for this but instead work together to make it easier to embrace wellbeing in its widest sense. I firmly believe the call for change we see in politics just now is people finally saying we need to change how we do things. And that's scary, but maybe it's scarier to do nothing? Governments can't have all the answers, no one does but let's give our support to those who are willing to focus on wellbeing for all, foster thriving communities and who demonstrate compassion for all. We can make that difference and the right time to start is now. For my fellow Cohen fans....here he is throwing out a challenge as only he can do..as he says ,its almost like the blues. My life at the moment is a very delicate and rich balancing act of running my business, attending hustings with the aim of being selected to stand as an MP and being a Mum, a wife and a daughter too. As I write my daughter is traveling to see us and I'm so looking forward to seeing her for a few days. Last weekend was seeing my Mum in her care home, looking fragile but happy with new friendships strengthening. Undoubtedly the trip to see her great grandsons was her highlight. Just the smiles on their faces bring her alive. As we returned back to the home we were greeted by the cat. Her name is Mama one of the other residents told me. Mama was the focus that day. 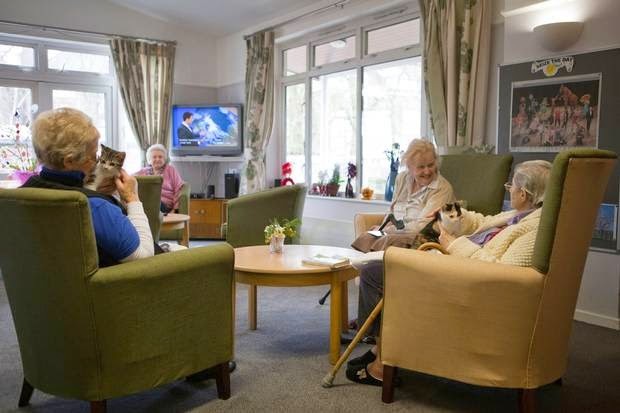 Everyone from the staff to the residents had a special hello, a purr filled welcome. One of the gentleman was in singing mode too and as Mum joined them in the dining room, everyone was listening; a special atmosphere settling. His words maybe didn't match the music but his animation was transfixing and joyful too. "Who told him he could sing?" Mums friend said. She replied I "hope it's not catching" ( she has a horror of singing in public).So we laughed but also agree that had my Dad still been with us he would have been joining in, never one to miss the chance to sing. The warmth of the home means there is real sense of life being lived here. It's probably why whenever I phone Mum isn't in her room, choosing instead to join the others. The upside of giving up her home is that loneliness is a thing of the past. As we left she waved with a smile and my heart lifted till the next visit. You will understand that few days later when I read this fabulous article by Atul Gawande about how a young doctor brought a nursing home back to life, it moved me deeply. It's so uplifting to read, to be encouraged by his boldness and to see the results. He made me want to set up a nursing home and do the same, sometimes direct action is the way to enable the change you want to see! This story has so many layers to learn from. He was bold, he was willing to stand out from the crowd, he was willing to fail,he saw what needed to change and he followed that through. Truly inspiring. Maybe that's where my worlds meet? In being willing to not only campaign for but also put into action what I believe in and be willing to risk failing. The campaigning work I have done in the last year has been, for me, all about creating a more just, fairer and as a consequence more prosperous society, where every voice matters equally. Achieving that in Scotland, I have come to believe is through us having most, if not all, of the powers here. That's why I'm going out these cold January evenings to seek the support of those members to choose me as their MP candidate. I'm not the pushiest, not the noisiest either, that's just not me. But my track record shows my tenacity, my determination and my ability to lead and make change. Whatever the outcome, it's an amazing experience and what I do know is I'm going to do my best in whatever way I can to help a fairer and more equal society emerge. I know I'm not alone in wanting that. If I can inspire others to do what they can too, I will be delighted. Look out 2015, my sleeves are rolled up! It started with a pledge to write a book about my experiences and life and how they have shaped me. Not on January 1st but after my annual visit to Windsor for the leadership dialogue, at the end of January. So I got down to it, found I loved committing those words to the page ..... it became a therapeutic process. Acknowledging the grieving I had done but also the joy I have experienced and what I have learned; I recommend it, I really do. Recently I joined a creative writing group and that too has enriched my life hopefully in time my writing too. So all good....until I tried to write the last chapter. Perhaps it's that phrase itself that makes it hard: the last chapter. Part of me realised then that maybe I was almost accepting that this would be MY last chapter. That second cancer diagnosis (however early and not life threatening at this point) had crept into my future and was threatening to steal it...but really only in my own head. I'm so glad I realised it then as something powerful shifted for me. A burden lightened and my sleeves got rolled up. I have loved 2014 since then. My work is not only interesting, immensely satisfying, it's also inspiring and motivating. The Health and Social Care Academy is beginning to impact on transforming health and care, my work with the WEL is life changing, developing the coaches for person centred care too is a personal highlight. Im also looking forward to launching the findings of the Workplace of Tomorrow forOasis School of Human Relations soon, ensuring 2015 has an exciting start.I'm honoured too, to be able to work with the other organisations, supporting in their own transformation. This is such a great chapter in my life when I'm able to bring so much of my learning and experience to enable others. But as the cartoon drawing above, which I got as a gift when I stood down as chair from the Health and Social Care Alliance (the charity I set up with others several years ago) suggests, I have been involved in other things too. The YES badge speaks volumes. 2014 was the year I found my inner politician! I have campaigned in both Westminster and Holyrood for many years,it's a crucial part of a role of leader in the third sector. And this year I used that experience to support the YES campaign. And whilst I absolutely accept the answer at the referendum. What I also know is the very conditions that created the momentum for change have not gone. The fact that Westminster no longer works for so many remains true. A year that saw inequalities grow, heard doctors and teachers tell the tales of the impact of hunger on those they serve, of the establishment supporting its own at the expense of so many others, of trident weapons prioritised over people being having a home or enough food to eat has left me determined to whatever I can to change this. So I have decided to stand for selection as an MP in Edinburgh for the SNP, in North and Leith and East Edinburgh. Reflecting the fabulous social and political engagement that has been a result of the referendum, many others are standing for selection too. So this may be the shortest political career on record! But after much deliberation, an occasional "am I good enough" doubt (in spite of many telling me how great I would be) what finally decided me was knowing that I could make a real difference if I was fortunate to get selected and then elected. My whole career has been about enabling others to have a voice, to be heard and I can do that in parliament, ensuring that those calls for change are acted on not just for the people of Scotland but all those across the UK who want change towards a fairer, more just and equal society. The sleeves are rolled up, the next chapter however it unfolds, is going to be good! A good new year to you all. If you want to learn more about my campaign please follow and like my Facebook page Audrey Birt SNP.